Numerous LED kits are sold to replace incandescent bulbs in passenger cars. I use individual LEDs. For the conventional operator this is the only practical way to get constant voltage lighting at all throttle ranges. 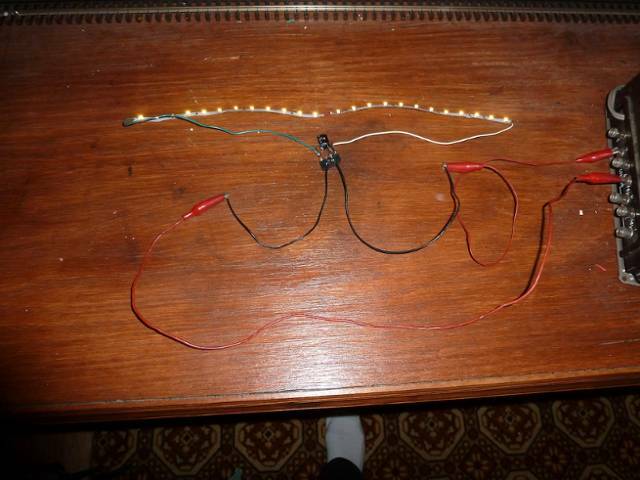 Here I posted several ways to use individual LEDs for cabooses,head lamps and passenger cars for both command and conventional. LED lighting has many advantages. Properly circuited they should last a lifetime,especially if you are as old as me. They consume much less power freeing wattage to use to power engines on a loop. For general lighting make sure you buy warm white,not cool white unless you like the harshness of the older style LEDs. 18 VAC becomes 24 VDC with the bridge and cap. That is 12 volts more than the strips require. If hooked up to a single strip they would burn out. However if we cut the strip in equal halves and wire in series, the voltage will be divided equally between the 2 strips and each will receive 12 VDC and should burn at maximum brightness. Lighting is subjective. Shown so far should get the maximum intensity from the LEDs. 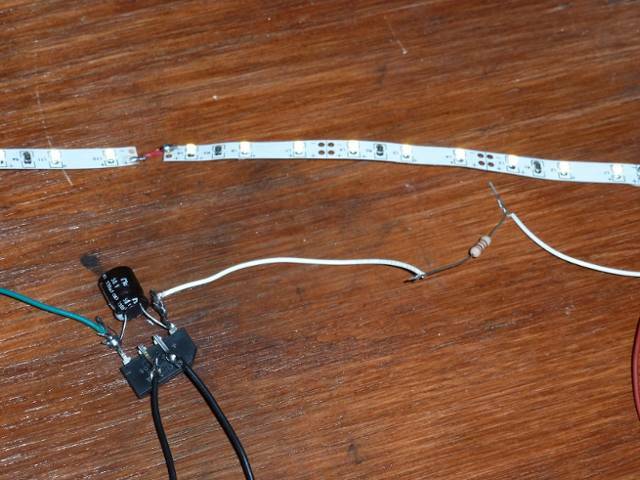 If this is too bright,simply adding a resistor in series to one of the DC leads will dim them. Here it is with a 1000 ohm half watt resistor,this dims it quite a bit. After a bit of experimentation with resistor values, you can get the desired results to suit your tastes. From 470 to 10K ohm ones can be tried. They can be put in series or parallel to change values,so you don't need a large assortment. 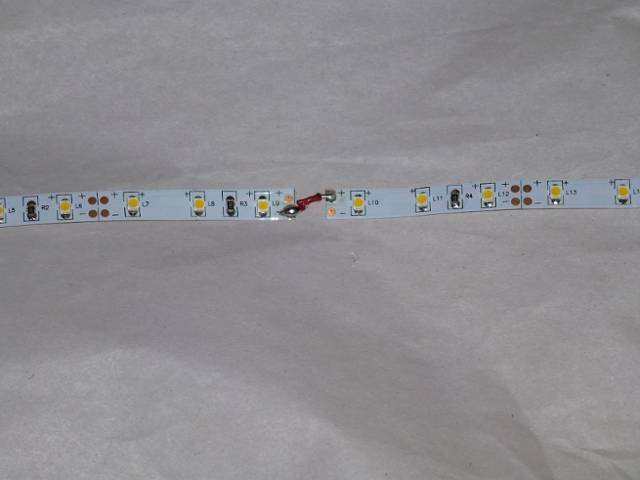 Another option from using the resistor is to wire the LED strips in series of 3 or 4,but they must be equal. I ran this and the other circuit a while,nothing got hot or even warm. 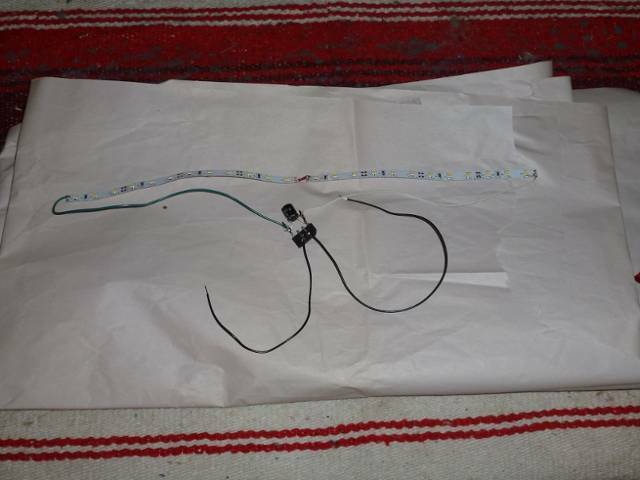 For DCS users,to reduce signal reflection install a small 22uf choke in series to one of the AC leads. 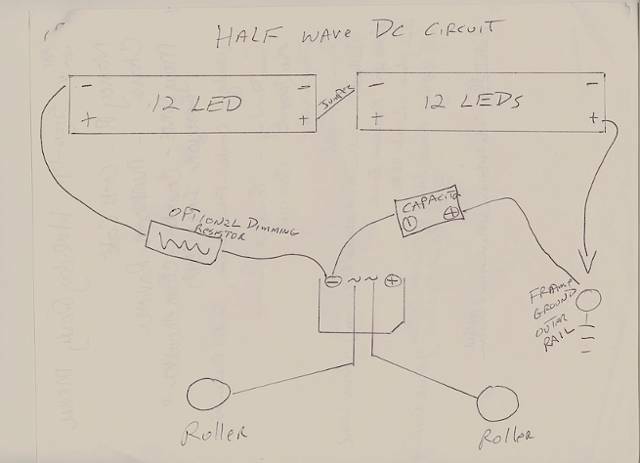 Lastly in the schematic you will notice a polyfuse installed between the rollers. This small thermal device opens around 1 amp. In a derailment,if one pickup roller is on the center,and one on the outer rail the small gauge wire connecting the rollers can burn up. This fuse can prevent that from happening. 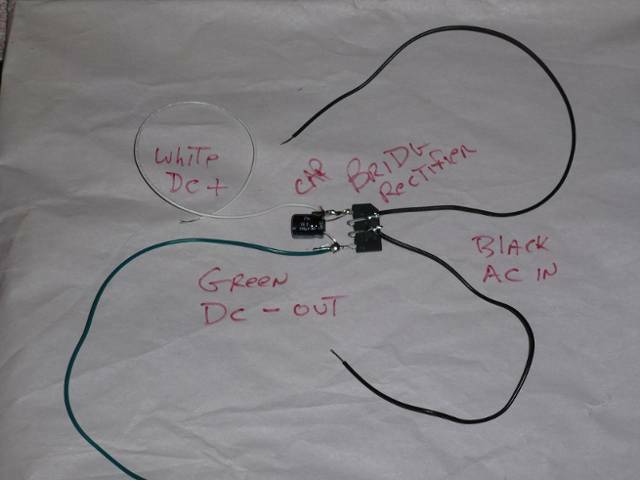 Another method to protect this wire is to use 2 diodes instead of a full bridge rectifier. 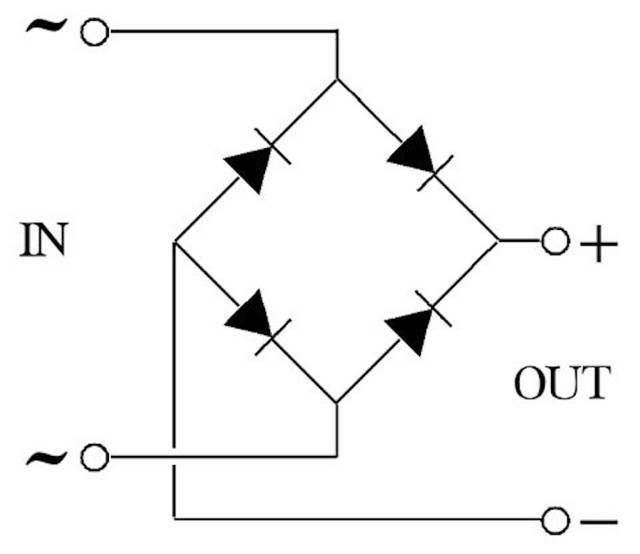 Current can not pass through opposing diodes. The downside of this is that it makes the capacitor less efficient,but the circuit uses so little current it works OK. 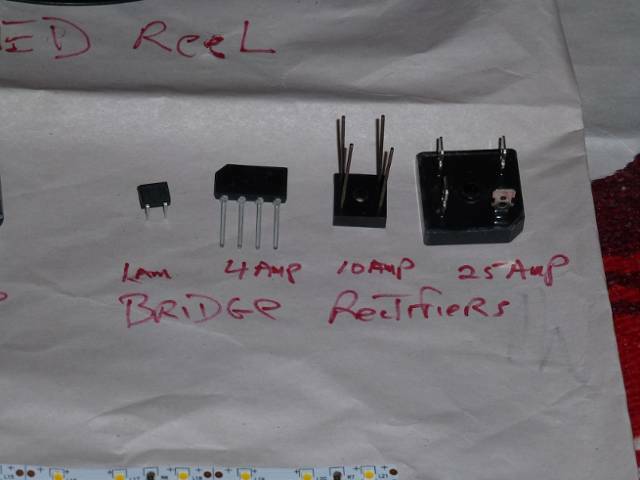 Besides using 2 diodes,3 lead instead of 4 of the bridge rectifier can be used. This is the same as 2 diodes and easier to mount. 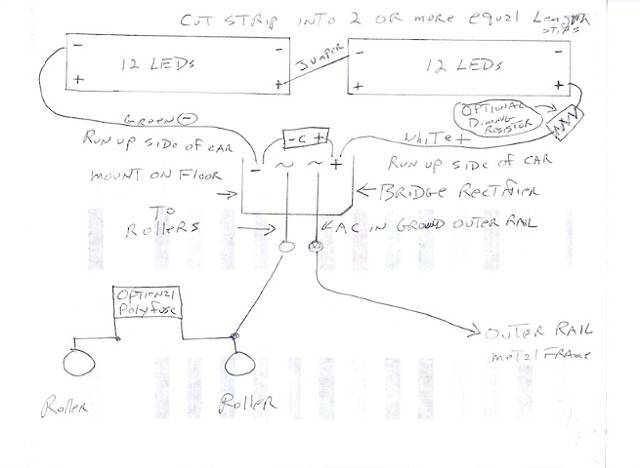 Shown are 2 schematics alternating polarity draw. For a passenger car set wire half the cars one way and half the other. This will balance the load for the transformer instead of drawing all from one half of the sine wave. 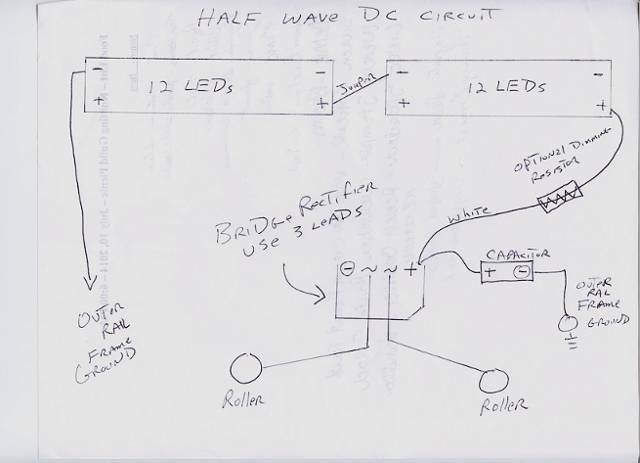 For those using light bulbs (which are often too bright in command) ,the bridge rectifier alone,wired this way will dim the light bulbs and current draw in half and protect the wire also. Make sure you insulate leads shown so that they do not touch each other or the metal frame. I use silicone gasket compound and electrical shrink tubing. 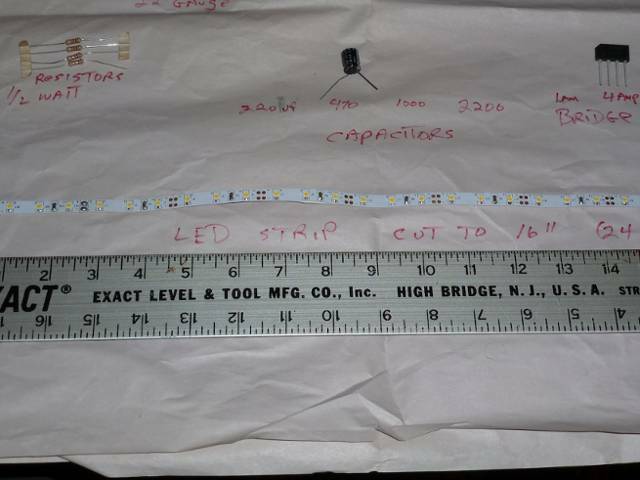 If you look through my blog of LED circuits linked in the first post,there are photos of these being used in wiring single LEDs. The DYI cost is maybe $2 to $3 per car. Once made they are as good or better than buying premade ones and you can customize lighting to your individual tastes and needs. 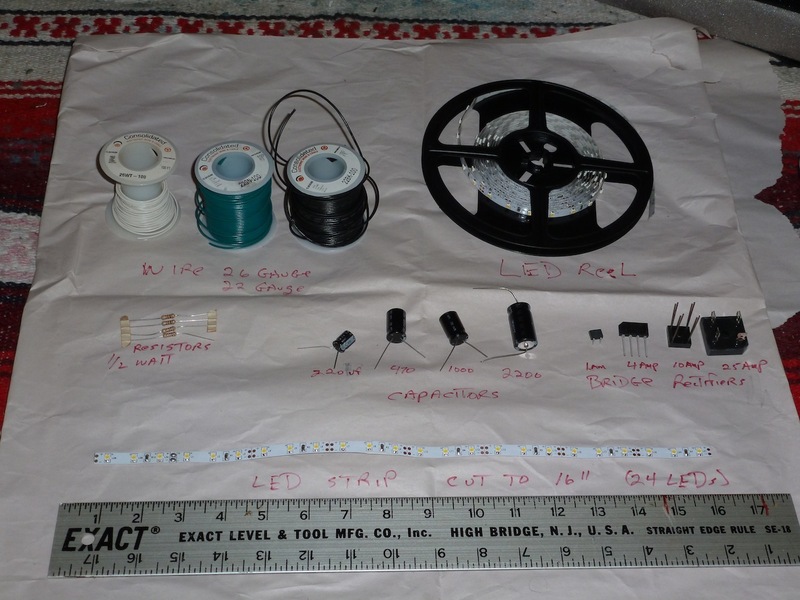 LED reels can be purchased on Ebay and the rest from electrical supply houses. http://www.Mouser.com and http://www.Allelectronics.com are 2 I use. RadioShack is expensive,OK in a pinch if you just need a few things. I posted this in response to some Emails I received from some OGR members who asked my opinion on lighting strips for cars.